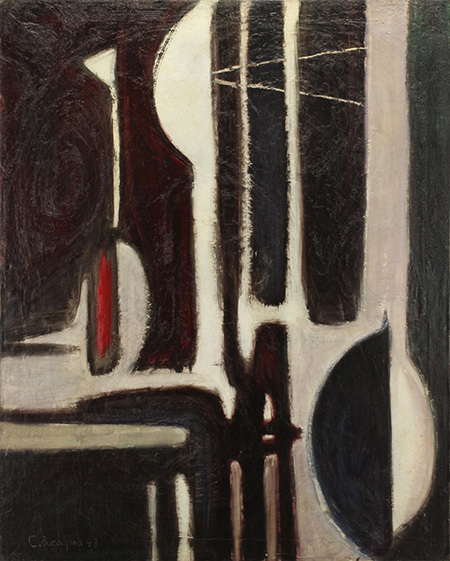 Lawrence Calcagno, "Semaphores," 1948, oil on canvas, 40 x 32"
"Not Famous But Important." That's how abstract expressionist Lawrence Calcagno described himself on a journey to the Soviet Union, and it provides the title of this exhibition pairing Calcagno with Louis Catusco. Though both were abstract painters who spent time in Taos, their personalities bore no mutual resemblance. Calcagno studied under Clyfford Still, Ed Corbett and Richard Diebenkorn, and exhibited at Martha Jackson Gallery in New York City. He was an avid traveler who painted his way across the United States and Europe. Conversely, Catusco stayed put: after studying at the Brooklyn Museum under the G.I. Bill, he enrolled at the Taos Valley Art School and studied under Louis Ribak. He moved to New Mexico permanently in the 1960's, and adopted an ascetic lifestyle akin to that of his Taos contemporary Agnes Martin. Calcagno and Catusco's polar temperaments are evident in their work. Calcagno unselfconsciously plumbs the sensibilities of Diebenkorn, Still and Mark Rothko, building his own soft and sensuous abstract language from inherited palimpsests. His works feel measured, as though he was keenly aware of the narrow path to greatness that his forebears walked. Catusco was wildly experimental, filling sheets of paper with symbols rendered in ink, watercolor, acrylic and conte crayon. The influence of Ribak and his partner Beatrice Mandelman is visible here and there, perhaps a hint of Cy Twombly, but much of Catusco's work is purely idiosyncratic. Calcagno and Catusco may be an odd coupling, but there's so much artistic vigor to celebrate in this exhibition that it's easy to look past the discrepancy. For very different reasons, both artists deserve to be a little more famous.